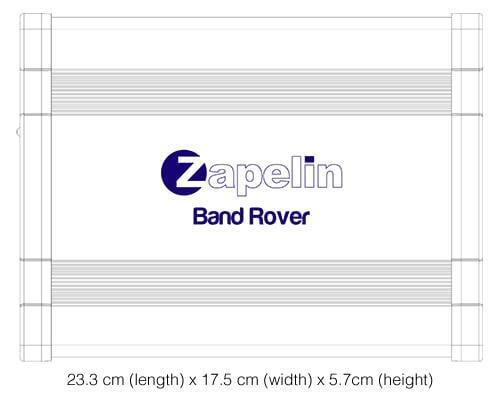 Zapelin Media was awarded the prize for Innovation & Entrepreneurship in 2016. The prize was awarded by Caixa Bank with the collaboration of the Ministry of Industry, Tourism and Energy through ENISA. The Micro ZMS takes transcoded IPTV channels (from the Muxing Engine) and generates a DVB-T or even ISDB-T output with just 1 MUX to “inject” up to 20 channels into an existing Coaxial Network. Thanks to the Muxing Engine & the Micro ZMS, the TV’s on the Coaxial Network simply need to be “re-tuned” to detect the new IPTV channels that are being injected. The Micro ZMS has a single BCN connector. It is simply necessary to connect a Coaxial Cable from the Micro ZMS to the Headends of the Hotel/Community/Ship. Broadcast your IPTV Streams throughout a Coax Network! Once you have generated a MUX with our Cloud Muxing Engine which contains the IPTV streams of your choice, they are ready to be delivered to the Micro ZMS. Just provide the Micro ZMS with a dedicated Bandwidth connection and attach the Coaxial Cable to our connector and observe how your entire MUX is now distributed throughout your Coaxial TV network. All the Streams inside your MUX are "injected" into your Coaxial TV network so it is automatically distributing the "channels" to ALL the Television sets that are connected to the Coaxial TV network throughout the entire building. It does not matter if your establishment has 1 TV or 1000 TV's, they will all be able to "pick up" the channels that the Micro ZMS is now injecting. Robust hardware that is built to last. The Micro ZMS does not contain any moving parts. The components do not generate heat so does not require ventilation. Absence of ventilation holes prevents dust from getting in making the Micro ZMS much more durable. Although the new internal components require no cooling, the circuitry is being cooled thanks to the very nature of the materials holding it all together – top grade Aluminium. The Aluminium Unibody design makes the Micro ZMS the most portable, robust and resistant ZMS to date. Once the Micro ZMS has been correctly installed in the desired establishment, there will be no need to go near it again. The Micro ZMS obeys the instructions that are sent to it from the Muxing Engine in our Cloud. The Muxing Engine settings & configuration can be accessed via a web browser so you will be able to make your changes from anywhere at any time. Even if you "add" or "remove" IPTV Streams to the Muxing Engine, the Micro ZMS will do as instructed. Of course, if channels are added, they will not automatically appear on TV screens unless these are re-tuned. *The Micro ZMS will ONLY work with our Muxing Engine. For every Micro ZMS a Muxing Engine is required. Contact us or your distributor for volume discounts. Tax & Shipping costs are not included in this price. 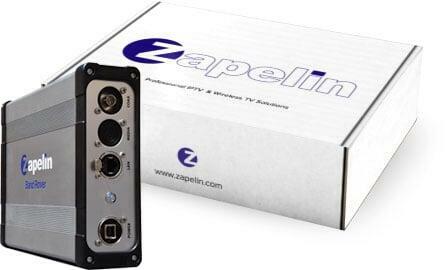 The Micro ZMS must be installed by a qualified TV/Sat Engineer with the appropriate equipment. 1 Channel Mux (Multiplexers) either DVB-T or ISDB-T transmission. Frequency Bands: UHF, VHF – LCN (Logical Channel Number) allows you to personalise the order in which the channels are listed. Most parameters are configurable in the Muxing Engine which can be done through a Remote Connection. Physical presence is not necessary as long as the ZMS has an Internet connection. Can Inject a maximum of 20 channels in MPEG4 The TV’s on the Coaxial Network must be at least MPEG4 compatible in order to be able to tune the channels injected by the Micro ZMS. POWER: Powered by a 5V DC USB making the Micro ZMS incredibly energy efficient (included).